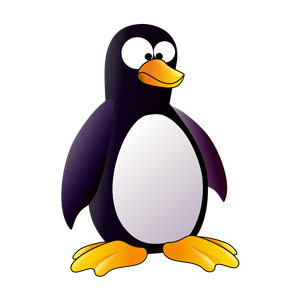 Penguin 2.0 Recovery Guide- Get Back the Lost Rankings and Traffic! Google launched the Penguin update 2.0 on May 22nd, 2013. Many webmasters who have followed a spammy link building strategy building links from low quality article directories, free blog hosting sites, low quality directories have been penalized by this update. Other factors which Penguin considered includes- similar anchor text backlinks, less brand related anchor text and less authority backlinks. 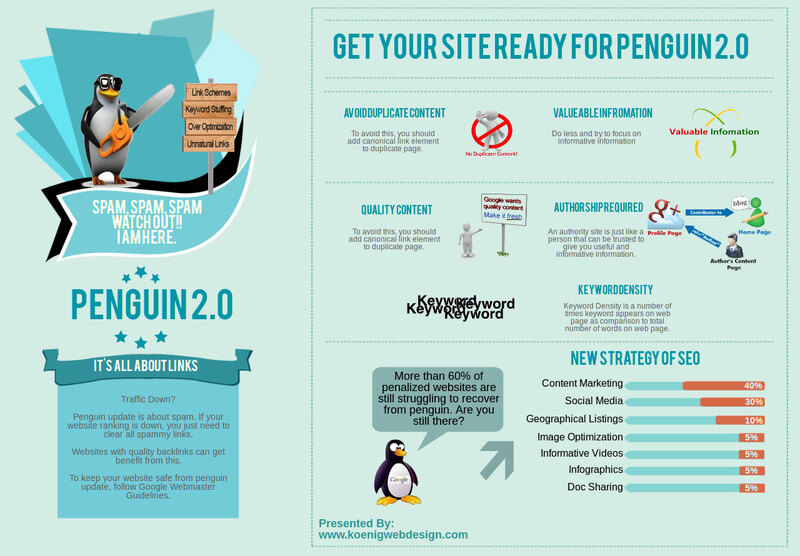 If your website has been penalized by Google in this recent Penguin 2.0, then here is a quick guide to Google Penguin 2.0 recovery. Link profile can be of two types- high quality vs lowquality. Sites having a low quality link profile have been penalized by this update. Steps to Recovery - Analyze your link profile using tools like ahrefs, seomoz, link detox etc. Prepare a list of low quality backlinks (PR 0, low DA, less user friendly spammy links) and then send an email to the webmasters requesting them to remove the links. 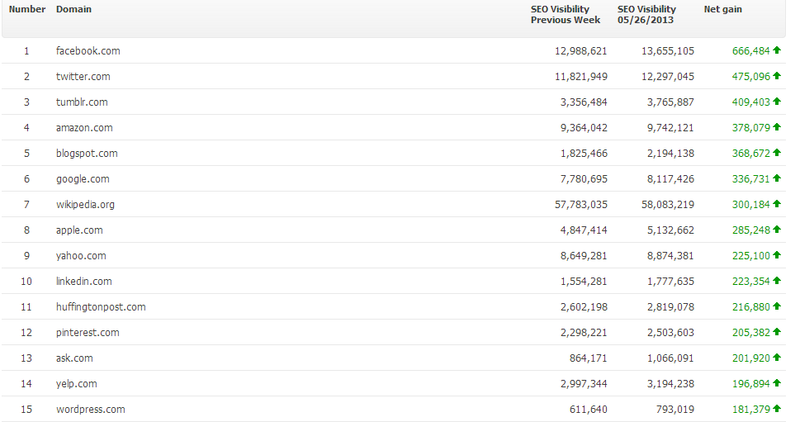 Re-analyze the remaining links, prepare a disavow file and submit it using Google webmasters tool. Presence of low quality content can also be a reason of penalty. Low quality content can be of several types, duplicate content, missing content, keyword focused content and unauthoritative content. Steps to Recovery- Complete the missing content and rewrite the content focused around keywords. 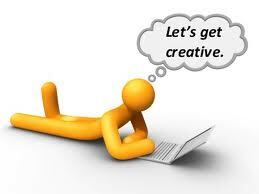 Make sure to have original content on each and every web page of the site. Mention proper references and citations wherever necessary. Sites having too many exact match anchor text focusing around specific keywords have been penalized. Steps to Recovery- Change all the anchor text and make them look natural. Use brand related anchors. 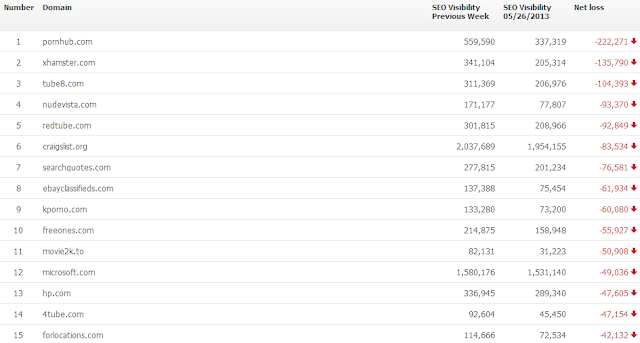 Links from non relevant sites that are unrelated to your niche can be a good reason for a Penguin penalty. Steps to Recovery- Remove all unrelated backlinks and get high quality, relevant and authority backlinks. The frequency with which links are created are also a signal for the penalization of a website. 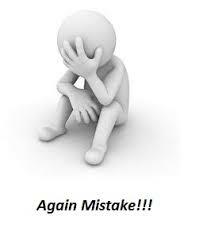 Getting too many links within a short time period without any solid reason can make Penguin axe your website. Steps to Recovery- Maintain a balance with which links are created to your site. Avoid using mass link link building software. Try to get links from quality websites and avoid getting too many links from spammy domains. 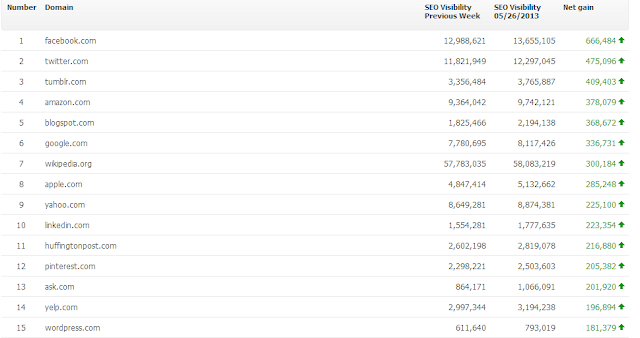 The image below shows the websites that have been affected the most by the Penguin update. 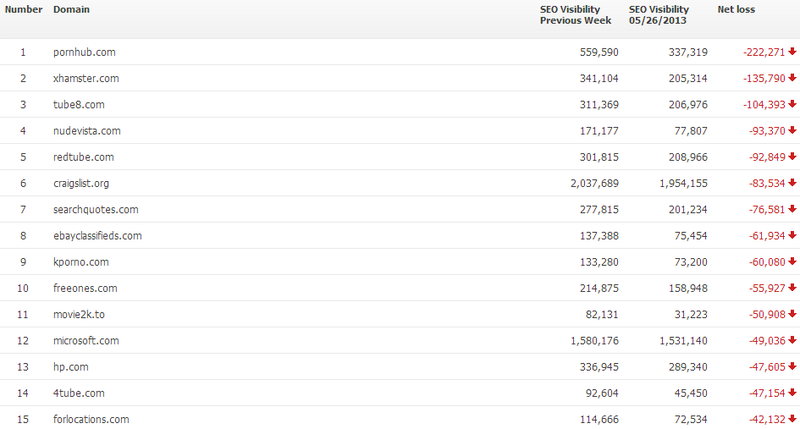 The image below shows the websites that have been affected positively by the Penguin update. Google Knowledge Graph was launched on May 16th 2012 and is considered as one of the major discoveries that was made to enhance the existing model of Google search engine enabling it to find the relationship between searched entities and provide the user with the best possible results without having them to navigate to a different website in order to find the answers. It has been referred to as the "Future of Search" by Google. It enables us to find information about people, places and things. Google is not the first to research in this regard, similar model has been applied before by computational search engine Wolfram Alpha. But, certainly Google's attempt to categorize people, places and things together is more enhanced and valuable. As such, it becomes important for all of us to have a deeper and better understanding of what the Knowledge Graph holds for us in future? The future search engine must have the capability to understand the user's intent when searches are made. The Knowledge Graph is an extension towards this possibility. As for example, if any user types the query "Taj Mahal", then he finds information about the monument displayed on the right hand side of the search results along with some other links under "People also searched for" which Google thinks to be relevant and associated with the main object "Taj Mahal". At the bottom of the associated entities, we can find another object under "See results about" which is semantically related to the main search query. However, Knowledge Graph doesn't displays results for all queries. It is still building and soon more and more entities and their relationship would be added in this massive database of semantic world. How Does Knowledge Graph Works? It works by understanding the users intent with respect to the search query. People are looking for answers or explore more on a particular topic. Knowledge Graph predicts this behavior of the user and presents the most relevant entitities and their relationships in the form of Graph. If we move deeper then there are two types of queries processed by the search engines, namely navigational queries and research queries. Navigational queries corresponds to direct queries where people want to quickly navigate to a particular page and they already have information about the searched query. An example would be "Facebook". As opposed to navigational queries, research queries are much wider and the users do not know where to navigate as they are still searching for information. Knowledge Graph works for research queries and helps users quickly resolve their questions. 1- Google predicts the factual entity referred by the search query. 2- The Factual entity is searched in the database alongwith semantically related entities. 3- Content is identified based on algorithms and displayed in the knowledge panel. Google makes use of several sources while presenting the data before the user. Some sources are Wikipedia, Freebase, CIA World Factbook (For General Data) and National Library of Medicine, National Institutes of Health, US Food and Drug Administration etc. for data related to medicines and drugs. Currently the Knowledge Graph contains over 570 million objects and over 18 billion facts semantically related with those objects which helps to predict the relationship between objects and facts as per the search query. Like every other business, Google also explores sources of revenue with every new research and model it launches for the benefit of the users. Knowledge Graph is no exception to that. Google's head honcho, Larry Page had said "Knowledge Graph does run on the right hand side where the ads also run". Now you get where all this stuff is going? This was reported by Wordtream's Elisa Gabbert. (See - Knowledge Graph Conspiracy Confirmed). It was basically done to navigate users to the right hand side of the search result page where the ads run. This makes organic results less countable and provides the big G with more options of increased revenue. Ever thought of having a customized knowledge graph for your own company? Yes, that's possible. Customized semantic web applications can be created using platforms like Poolparty. An interesting insight towards this possibility has been made by Andreas Blumauer here:- How to set up a customized Knowledge Graph for a certain company? What will happen when more and more people will find answers to their queries directly on Google's result page without navigating to another website? What will happen when organic results would loose its current importance due to larger emphasis on Knowledge Graph? These are some of the questions which are being put forward by the Seo community. Google says - only the most accurate content is presented through the Knowledge Graph making it hard to crack into by Black Hat SEO's. (Source:- memeburn). Search engine optimizers will need to optimize the content and increase the presence of the content on social websites. Content should be connected to one other in order to form relationship between entities. Google Authorship must be used in order to make it more authoritative in the eyes of Google. The quality of the content now matters much more than the quantity of the content. 1- Optimize your landing page. 2- Study metrics like Clickthrough Rate and Bounce Rate. Optimize your web pages so that it has a high clickthrough rate and a low bounce rate. 3- Make use of Google Authorship as it is the best way to find relationships. 4- Use microdata reviews and stars in order to make content more user interactive. 5- Use Schema markup for local Seo. 6- Use Rich Snippets for local search. Moreover, Knowledge graph still uses a tiny portion of the search queries and organic search results are still the way for users to find the best results. There is much more for search engine optimizers to explore and change.